RALPH SHELDON was fortunate not to have been drawn into the 1583 Throckmorton Plot to murder Queen Elizabeth and replace her on the English throne with Mary Queen of Scots. It was one of many conspiracies against the Crown that went on around Ralph during his lifetime but in which he avoided involvement. 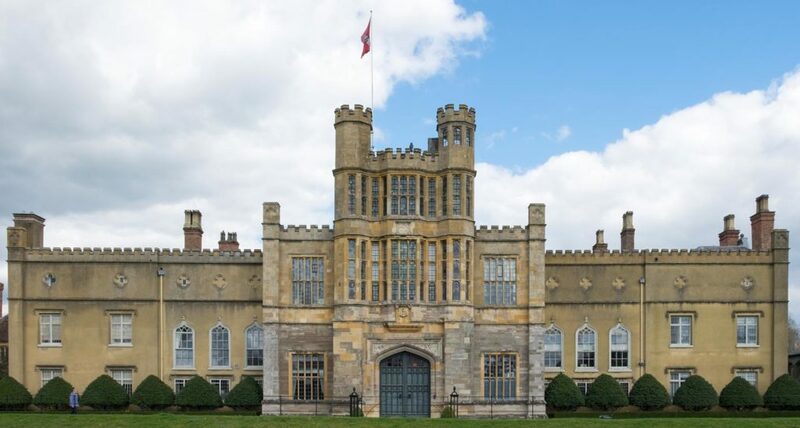 The Throckmorton conspiracy resulted in the arrest and execution of his brother-in-law, Francis Throckmorton, not only a close family member but also a near neighbour at Coughton Court, barely six miles from Ralph’s home at Beoley. A search of Coughton revealed a list of the conspirators, among whom was another of his wife’s brothers, Thomas Throckmorton, along with brothers-in-law Sir William Catesby and Sir Thomas Tresham. Under torture, Francis gave details of rebel plans to invade England with the help of French troops and place Mary Queen of Scots on the throne. He revealed the names of several co-conspirators in his subsequent confession. The Throckmortons had remained steadfast to the Catholic faith and Ralph’s easy-going nature was perhaps instrumental in him becoming more and more under the influence of his wife and inlaws. Ralph’s reluctance to embrace the ‘new religion’ led to him being imprisoned at Marshalsay, London. His wife petitioned for his release on health grounds and eventually he was released into the care of the Dean of Westminster to recuperate and reform his “errour in Relligion”. After his release he spent time living in Paris before returning to his family home, where he continued to find himself accused variously and vaguely of recusancy and sedition. In 1594 he was alleged to have been involved in a rebellion in North Wales, “the chiefest aid for which is to come from Ralph Sheldon”. Another accuser claimed that he sent an emissary to Louvain “on pretence of fetching hawks but really with letters to Cardinal Allen”. The house at Beoley was searched, but nothing incriminating was found. In August 1594, he managed to fight off allegations of involvement in plots to kill the Queen, and to offer the Crown to the Earl of Derby, with the aid of the King of Spain. COUGHTON COURT: Home of the Throckmorton family and central to the Gunpowder Plot of 1605. Strangely, there appear to have been were no attempts to implicate Ralph in two of the most ambitious conspiracies against the Crown, the Essex Rebellion of 1600 and the 1605 Gunpowder Plot. In 1605, many of Sheldon’s influential friends and neighbours were gravely implicated in the Gunpowder Plot to blow up the Houses of Parliament, together with King James I and the whole of the Protestant government, during the opening of Parliament on November 5, 1605. Coughton Court and the wider Throckmorton family once again played a key role in the plot, but again Ralph appears to have been exonerated of any involvement, though it’s hard to believe that with so many of his close friends and relatives involved he had heard nothing about it until after the event. The ringleader was Ralph’s cousin and close friend, Robert Catesby, son of Sir William Catesby and Anne Throckmorton and nephew of Thomas Throckmorton. Their respective wives were stepsisters. Catesby had earlier been involved in the Essex Rebellion of 1601, during which he was wounded and captured. Queen Elizabeth allowed him to escape with his life after fining him 4,000 marks, the equivalent of more than £6 million in today’s currency. The existence of the Gunpowder Plot was revealed in an anonymous letter sent to Lord Monteagle, who was due to attend the opening of Parliament. The so-called Monteagle letter survives in the National Archives but the identity of the writer remains to this day a mystery. 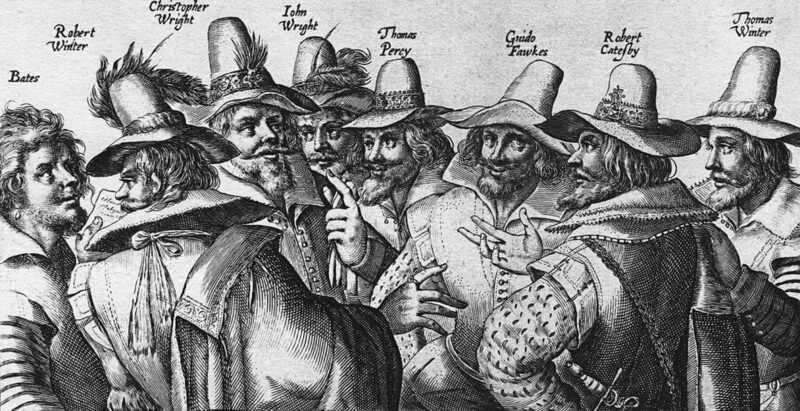 Guy Fawkes had been tasked with preparing and igniting the 36 barrels of gunpowder the plotters had hidden in the cellars underneath the House of Lords but early on November 5 the cellars were searched and Guy Fawkes was captured. He was taken away and tortured to reveal the names of the other plotters. GUNPOWDER PLOT CONSPIRATORS: The plotters, as depicted by an unknown Dutch artist. Many of the other conspirators had gathered at Coughton Court to await the outcome. A Catesby servant brought news of the plot’s failure and on hearing it they fled, some going into hiding, one escaping to France. On November 6th most of the plotters – Robert Catesby, Thomas Percy, John Grant, Thomas Wintour, Ambrose Rookwood, the brothers John and Christopher Wright – found their way in heavy rain to Holbeach House in Kingswinford, Worcestershire, soaked to the skin and with a large cache of sodden gunpowder. Bizarrely as it would seem to us, they spread the gunpoweder in front of a fire to ‘dry out’ . A Sheriff’s posse of 200 men, hot on the trail of the plotters, saw the explosion from a distance and quickly besieged the house. A fire fight ensued, during which Catesby and Percy were killed by a single musket shot. Both Wright brothers were also killed. The Sheriff’s men then rushed the house to arrest Grant, Rookwood and Wintour. They and the remaining plotters were subsequently tried and convicted of treason and were hung, drawn and quartered at the end of January 1606, the traditional grisly fate of all traitors at the time. 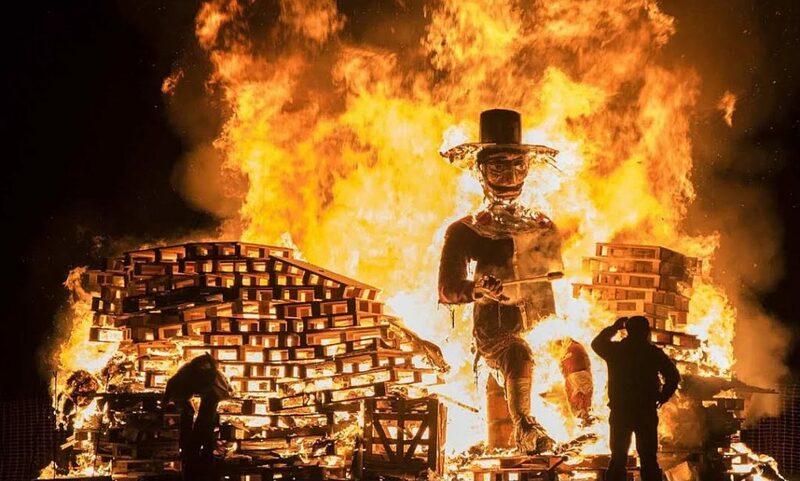 BONFIRE NIGHT CELEBRATIONS: The burning of effigies of Guy Fawkes remains part of the annual November 5th ritual across the UK. 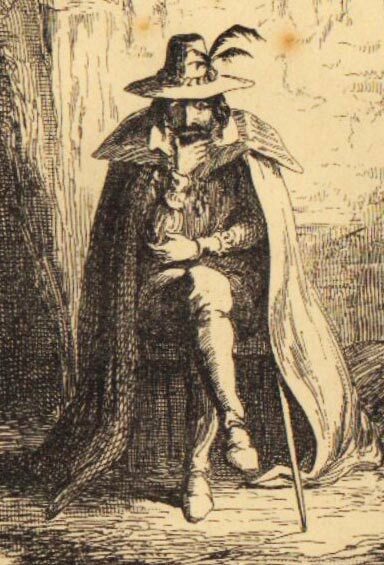 PENSIVE GUY: A 17th century likeness of Guy Fawkes. In the immediate aftermath of the plot, Londoners were encouraged to celebrate the King’s escape from assassination by lighting bonfires. A subsequent Act of Parliament designated each November 5 as a national day of thanksgiving for “the joyful day of deliverance”. It remained in force until 1859. Guy Fawkes, as the individual most associated with the plot, became its figurehead and ever since Britain has celebrated November 5 as, variously, Guy Fawkes Night or more usually now, Bonfire Night. Bonfires were accompanied by fireworks from the 1650s onwards, and it became the custom after 1673 to burn an effigy – at that time usually of the Pope. Most modern effigies are of Guy Fawkes, the ‘guy’ normally created by children from old clothes, newspapers and a mask. In the days leading up to November 5, children traditionally parade their guys through the streets calling for a “penny for the guy” in order to raise money to buy fireworks. These days Guy Fawkes is seen as a rather more engimatic figure, with many cynically regarding him as “the last man to enter Parliament with honest intentions”. The Plot certainly changes the course of the history of Sheldon family, as we will learn from looking at the lives of subsequent generations. Fighting the various accusations levelled at Ralph Sheldon and dealing with the restrictions placed on his activities and finances because of his adherence to his faith robbed him of much of the wealth accumulated from his father’s various business activities and investment, so much so that he died a relatively poor man. Ralph Sheldon died at the age of 76 in 1613, ten years after the death of Queen Elizabeth, surrounded by many of his 130 descendants. Chief beneficiary in his will was his only son, Edward, though there were bequests to each of his seven daughters still living, all of whom had married into influential local families. His death in effect marked the beginning of rather more turbulent times for the Sheldon family and the gradual decline of 400 years of influence and involvement with the most powerful figures and families of the day. From hereon in, far from being part of the ‘English establishment’, they will find themselves increasingly at odds with the state. “Sacred to the memory of Ralph Sheldon esquire, a man of great wisdom, modesty and kindness, remarkable for his gifts of knowledge and judgment, a rare mixture, a generous and beloved citizen. “He lived supremely blessed, remote from ambition, and shunning honors, lord of himself and great to his own person, likewise a learned friend of learned men, and to his friends as patron and companion, pleasant, wise, restrained, steady, good, loyal.